The celebration of carnival in Saint Kitts and Nevis starts in late November and continues during the Christmas season culminating at the beginning of January. A lot of colorful parades, street performances, competitions, shows and other activities take place during the carnival that blends the colorful display of the nation's culture and African heritage with the spirit of Christmas and New Year. There are several folklore groups that traditionally take part in the carnival. They are the Mummies, the Masquerades, the Mock Jumby, the Bull, the Clowns. These folklore groups have been performing on the street for generations. The carnival attracts a lot of tourists from all over the world. 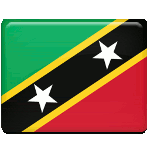 It is worth mentioning that winter carnival is mostly celebrated on the island of Saint Kitts. Nevisians have their own carnival during which they celebrate their heritage known as Culturama. It is held in late July/early August. Just like the carnival in Saint Kitts, Culturama has the status of a public holiday.